Boiled pork belly with garlic sauce (蒜泥白肉) is one of my favorite Sichuan cuisine dishes. It’s delicious, and it’s also a very popular dish in both Chinese and Taiwanese households. When cooking you need to bring the pork belly to a boil over high heat and then simmer for about 1 hour. You can use a chopstick to poke the pork belly while cooking, and if the chopstick can go through the pork belly, then the pork belly is ready. Try to slice the pork belly as thin as possible so you won’t feel the pork belly is so greasy and heavy to eat. Crushed peanut is an optional extra, but it does add extra flavor and texture to the dish. If you have a peanut allergy or think it’s too much hassle then leave it. It won’t affect the flavor of this dish too much. You can add some chili oil or Sichuan pepper oil if you like your food hot and spicy. Place the water, rice wine, salt, star anise, cardamom pods, spring onion, and ginger into a stockpot. Bring to a boil over high heat, then lower the heat and simmer for 30 minutes. Add the pork belly and bring to a boil. Lower the heat and simmer for about 1 hour until the pork is cooked—test by piercing the pork with a chopstick. The chopsticks should go through the meat easily. Set aside to cool. Reserve stock. Place all the ingredients for the garlic sauce in a bowl. Add 2 tablespoons of stock from the stockpot and mix well. Set aside for at least 30 minutes. Using a sharp knife, slice the cooled pork into 3mm (1/8-in) thick slices. 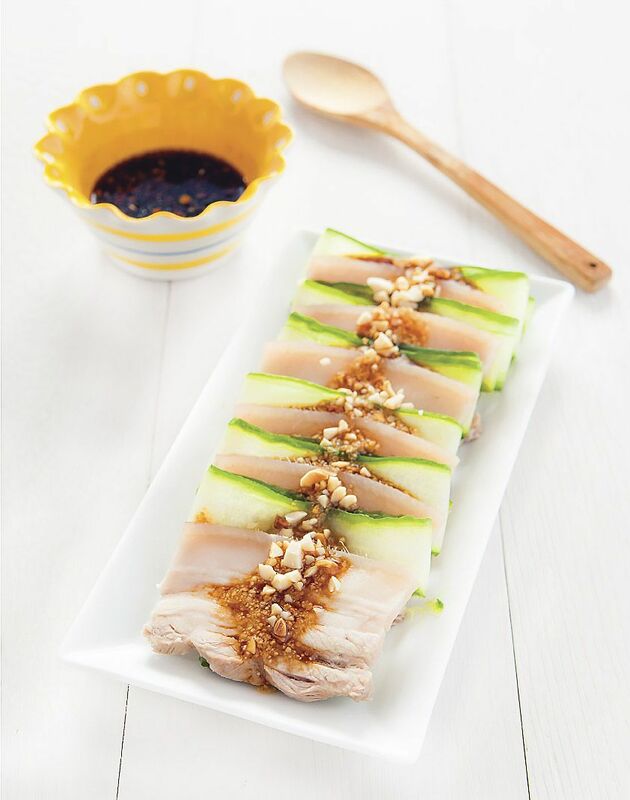 Arrange the pork on a serving plate with the cucumbers. Garnish with crushed peanuts if desired. Serve with the garlic sauce.